Our goal is to improve the quality of Oral and Maxillofacial Surgery in Tanzania and to make it available for more people. This goal can best be achieved by improving the self-sufficiency of the Tanzanian Oral and Maxillofacial Surgeons and by adapting to the local environment. More local Oral and Maxillofacial Surgeons have to be trained and equipped. To achieve this, we seek support from the Tanzanian government and the board of the regional hospitals. 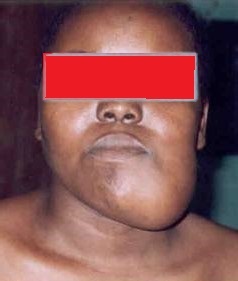 In Tanzania there still is insufficient availability and knowledge to treat patients with Oral and Maxillofacial diseases or pathological conditions. Most of them have infections, facial traumas or tumours of gigantic proportions. 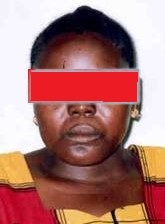 They are referred by ‘Dental Therapists’ (people with limited dental training) to one of the three local hospitals, or directly to the Muhimbili National Hospital in Dar es Salaam. These hospitals have a Dental department where an initial diagnosis can be made. Tanzania is about 945.087 km² (587 square miles) with approximately 50 million citizens. Dar es Salaam is located on the east coast, which for most of the citizens means several days of traveling from their own community. Currently, Dar es Salaam has the only place in Tanzania where specialist help can be provided with regard to Oral and Maxillofacial surgery. The main problem is: how can these patients function after the operation in their local environment? Major Oral- and Maxillofacial surgeries do not only lead to visible mutilations but often also create functional impairments. Can these patients eat their normal food in their home-environment and as a result can they have a normal life? In many cases the patient also suffers from anaemia or forms of malnutrition, requiring additional measures to be taken before the operation can take place. The flow of patients is immense. The team in Dar es Salaam tries to find individual solutions with relatively simple means. This allows most patients to function normally after treatment. 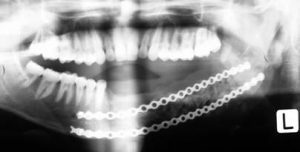 X-ray of reconstructed lower-jaw with plates to keep the bonetransplantations in place. Development aid is not just a matter of finance. The most important contribution we can make is to help improve the quality of treatment locally and enhance the skills and knowledge of the local colleagues. Therefore, it is essential to ensure a sufficient number of well qualified specialists. Due to the Foundation’s efforts and the help of the IAOMS Foundation there is currently enough expertise in the Muhimbili Hospital in Dar es Salaam. They now also have the necessary equipment and on site we support their efforts to develop new, enhanced procedures.